Tools, how would we do without them? If you think about it you always have tools. Most people have their hands, their fingers, their fingernails. With your hands you can make tools to accomplish tasks that alone they could not. Humans are the only creature on Earth to go one step further and use one tool to fashion another. While there are examples of animals using tools: chimpanzees using sticks to extract termites, horses scratching themselves with a stick, vultures picking up stones with their beaks to hammer open thick shelled eggs, otters breaking open mollusks with a rock—only man has taken tool manufacture and use one step farther. One of the things that sets humans apart from the animal kingdom is man’s ability to take the next step. The true survivor will take what he has to work with, however little that may be, and one step at a time advance uphill, taking each stage as a summit of development, instead of thinking of the impossibility of the task because they can’t construct the modern tool they are used to. 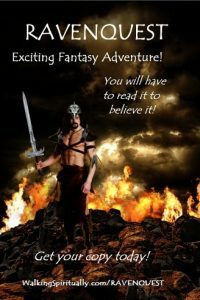 This installment of this blog will focus on celts, axes and hammers. 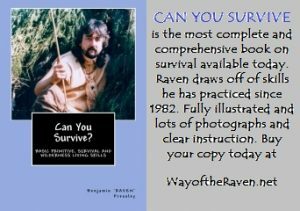 Tools you can make in a survival situation as needed. 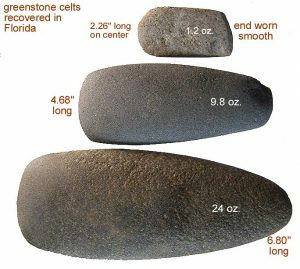 Throughout the Eastern Woodlands and beyond to many distant regions with hardwood forests, are found the greenstone celts so favored in the past for woodworking. 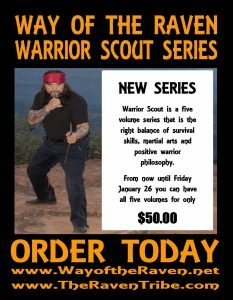 Some folks say these times are gone, but to many of us who have found we have a choice in how we live our lives, the sharp THWAAP of a greenstone bit cutting wood is the very marrow of our existence. 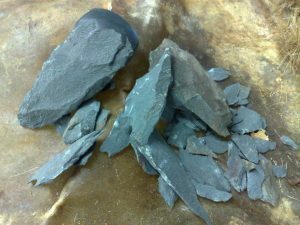 There are many types of rock and some minerals that will make a decent celt (I use the word ‘celt’ here to cover all forms of axe and adze varieties of which there are many, but will refer to specific types where needed.). 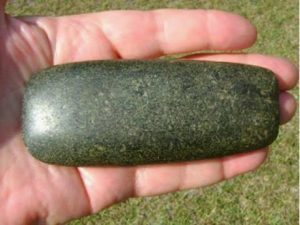 Most celts represent a large investment of time to make, so naturally folks in the past gravitated to rock types that were durable. Along the crest and as talus below, in the northern section of Shenandoah National Park, outcrops of catoctin basalt, referred to as ‘greenstone’, were worked into celts for at least five thousand years. W.H. 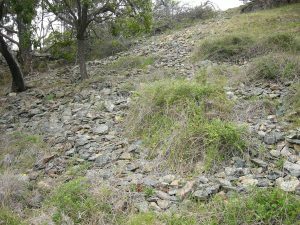 Holmes, our first archaeologist who used knapping as a method for understanding stone tool technology, reported on some of these extensive celt shops found on the valley floors, below the eighteen hundred foot thick lava flows. This was in 1897. More sites have been found since the greenstone from this restricted area of roughly twenty miles by two miles escaped the severe destructive metamorphism that the other couple of thousand miles of Blue Ridge underwent. Here, in Virginia’s Shenandoah Valley, nature has forged rock outcrops a half billion years old plus into the premier celt stone. 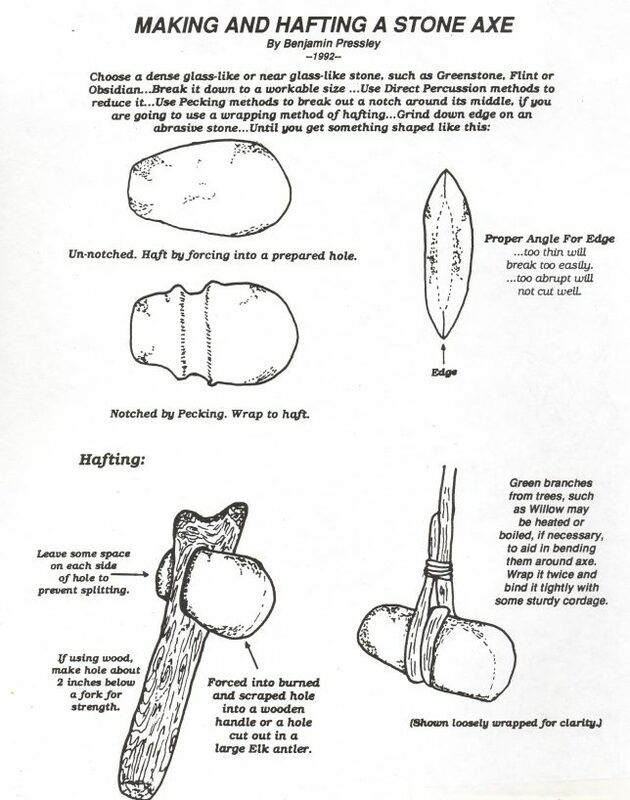 Using tough moose billets (or native copper) and softer grades of greenstone hammers, the raw stone is reduced to a preform where soaking in water, then observing it as it dries reveals any flaws. 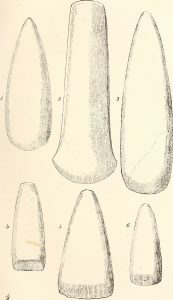 Flawless ones are then knapped into the blank stage for whatever tool type is desired. Blanks are then pecked into near final shape using the toughest flint family stone available. Grinding is done on rotted granite, sandstone or schist with coarse sands added as needed and enough water to keep things messy. Once ground to shape I switch to a very fine Arkose sandstone which contains minute and very sharp quartz grains loosely bonded by a feldspar clay. This produces a smooth finish which can be the final finish, but polishing will add much strength and produce a more efficient cutting bit because of its extreme slickness. Old leather knapping pads which are full of fine flint dust make excellent polishing pads. Lay one over a flat surface, sprinkle on a little water and rub like crazy. Polishing compounds made of natural minerals can be done in your abo mortar and pestle or bought in lapidary shops. As stone is strongest in compression, bit angles and arcs are very critical. Overly dull bits bludgeon the wood while overly sharp bits penetrate too deeply, get hung up in the wood and break. While the list can be extensive, I’ve done most of my abo woodworking with five types with a couple of variations to suit special tasks. 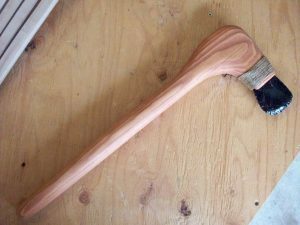 These are: Axe and hatchet with centered cross cut bit, carpenter’s hatchet with beveled edge bit Adze with standard or gouge bit mortising chisel and hafted sledges and hammers. 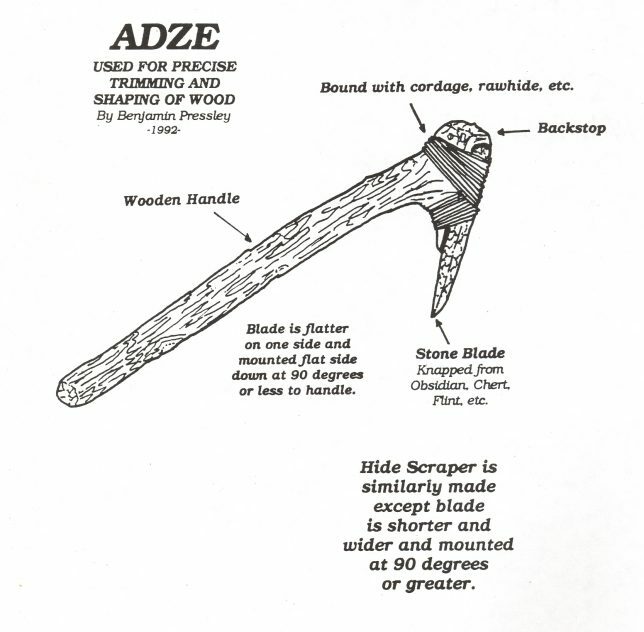 Thin adze blanks are sometimes used as wedges to split out bow staves. 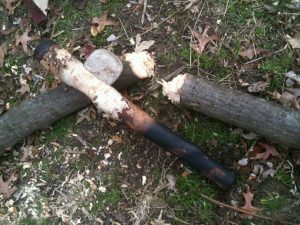 Tool handles are worked green with excessive drying controlled by keeping the wood in bark rolls plugged with damp bark fiber. Once roughed out and mortised, drying is speeded up to allow two weeks for complete seasoning. How efficient and durable are these tool types? No where near as good as steel, but pretty close to cast iron. 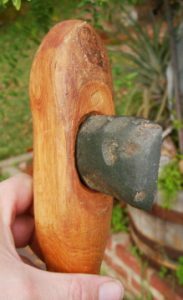 When used on green wood that is kept free of dirt and grit and care is taken to deliver well placed blows, at 75% the force you would use with steel, they will outlive you or I.
I cross cut an axe handle of Hop Hornbeam (Ironwood) that was seasoned using this tool with no damage or wear whatsoever. 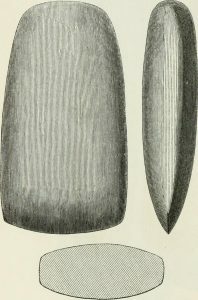 A medium sized cross cut bitted axe had a large spall driven from the bit when its user applied too much force combined with too angular of a strike. While you needn’t baby them, neither should you use them with abandon.